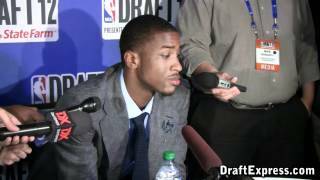 Michael Kidd-Gilchrist is the top ranked wing player on our board (Beal is in the guard group), but it's more so due to his abilities as a hustle player, competitor, defender, rebounder, and his ability to do all the little things so well than it is his ability to score the basketball. With that said, it's not surprising Kidd-Gilchrist ranks near the bottom of the wings we compiled stats for in overall scoring efficiency, at 12th of 18 overall with 0.948 points per possession. Kidd-Gilchrist's 12.3 possessions used per game also ranks second to last of all players, coming in only ahead of Kentucky teammate Darius Miller. When looking deeper into some specific numbers, things look more favorable for Kidd-Gilchrist, starting with him drawing a free-throw attempt on 18.2% of all possessions, which is easily the top number of all wings, and well ahead of Kris Joseph's second-ranked 15.0%. Kidd-Gilchrist gets out on the break the third most often of all wings, seeing possessions in transition 25.0% of the time, but scoring only a middle-of-the-pack 1.163 PPP on those possessions. He also sees shots around the basket more frequently than any other wing, with a staggering 47.9% of his half court field-goal attempts coming around the rim. His 1.222 PPP on these shots ranks only 11th of 18, but is still a strong upward drag on his overall efficiency due to the naturally efficient nature of shots directly at the basket. Looking directly on the other side of the coin, Kidd-Gilchrist's 22.4% of shots coming as jumpers is the fifth lowest rate in the group, and his 0.712 PPS on these shots ranks dead last, and well below second-to-last Khris Middleton's 0.827 PPS. It's fairly clear the simplest thing Kidd-Gilchrist could do to round out his game and fix a huge weakness in his game would be change his mechanics and develop into a solid spot-up shooter, even if that's obviously easier said than done. The other area Kidd-Gilchrist fares especially poor in is with overall turnover rate, as his 17.2% turnover rate on all possessions ranks second to worst in the group and worst among NCAA prospects. Given how often Kidd-Gilchrist is going to the basket, this is somewhat expected, as the more you put the ball on the floor the more likely you are to turn it over, but is still an area he could improve upon going forward. Mike Schmitz takes a look at the strengths and weaknesses of Michael Kidd-Gilchrist with the help of Kentucky game film, Head Coach John Calipari, and commentary from Kidd-Gilchrist himself. Michael Kidd-Gilchrist had a dream freshman season by any standard, being an essential cog on a Kentucky squad that won the national championship in emphatic fashion. Standing 6-7 ½ in shoes, with a 6-10 wingspan and a chiseled 228 pound frame, he has ideal physical attributes for a NBA wing prospect, and a versatile skill-set to go along with that. Offensively, Kidd-Gilchrist is far from what you would consider a go-to guy, as he actually took the smallest percentage of shots (18.6%, 7th on the team) of any player in Kentucky's rotation, relative to minutes played, according to Ken Pomeroy. His most prolific source of offense came from pushing the ball in transition, getting out on the fast break as well as any non-guard prospect in this draft. His size, strong frame, aggressive mentality and physical nature all help him out tremendously with his forays to the rim, as he simply refuses to be denied once inside the paint. Kidd-Gilchrist finishes 71% of his field goal attempts on the fast break, according to Synergy Sports Technology, which is #1 amongst all draft prospects. In the half-court, Kidd-Gilchrist doesn't have the most visually appealing style of play, but he finds ways to be productive, often through sheer desire and tenacity. He has the ability to go inside the paint and back down smaller wing players in post situations, showing great strength overpowering opponents and having no problems finishing through contact. He has nice touch around the basket and even a jump-hook he likes to utilize at times with his back to the basket situations, something that could become more useful as he improves his footwork and ability to recognize and take advantage of mismatches at his size. Kidd-Gilchrist has an excellent feel for the game, which shows up in the way he moves intelligently without the ball, as well as with his passing skills, which are very well developed considering his age. Not someone who can be expected to shoulder an offense considering his somewhat limited skill-set, he is the type of player who needs good teammates around him to fully utilize all the different things he does well. He really understands the nuances of making others better with his ability to set screens, pass, and make hustle plays, which is likely a big reason why he's always been considered such a winner from very early on in his career. With that said, he has a ways to go before he can be considered anything more than a complimentary offensive option, which is exactly what he was for Kentucky as their fifth leading per-minute scorer. He's an average perimeter shooter at best, making 26% of the 51 3-pointers he attempted this season, showing highly unconventional mechanics (shooting the ball on his way down, with his elbow flailing out) that could hamper him from ever becoming anything more than that later in his career. He doesn't have much of a mid-range game either, struggling to pull-up off the dribble effectively due to his crude shooting mechanics. Kidd-Gilchrist isn't a very fluid or polished shot-creator either, as he's not a very advanced ball-handler at this stage in terms of changing speeds and directions on his secondary moves. His first step is very effective, and he has extremely long strides and the ability to overpower defenders on his way to the lane, but if he can't simply blow by his man or get his shoulder past him, he struggles somewhat trying to create offense in isolation or pick and roll situations. Nevertheless, Kidd-Gilchrist found ways to help his team this year, be it crashing the offensive glass, cutting off the ball, getting out in transition, or drawing fouls and getting to the free throw line, where he converted a very solid 75% of his attempts this season. He's extremely versatile on defense as well, being asked to guard point guards to power forwards, sometimes within the same game. He has ideal physical attributes here, with his terrific size, strength and length. He also moves his feet extremely well, and is competitive a player as you'll find on this end of the floor. It's obvious that he truly enjoys his work here, which is pretty rare at his age. His shows outstanding instincts blocking shots and getting in the passing lanes, and does a great job of contesting shots, playing the game with a real nasty streak. The fact that he's strong and tough enough to defend many big men, yet has the agility to stay in front of guards makes him a real game changer covering the pick and roll, as he can switch onto virtually anyone without consequence. He also rebounds extremely well for a wing player. Kidd-Gilchrist is a unique prospect in this draft, as he doesn't really fit the prototype of what teams drafting in the top five typically look for offensively. What he lacks in scoring polish he makes up for in toughness and competitiveness, though, as he's a consummate teammate who shows no ego and only seems to care about helping his team win games. His work ethic is reportedly outstanding as well, as indicated by the well-documented Breakfast Club he started at Kentucky during Christmas break, urging teammates to show up at 6:30 AM every morning for weightlifting and shooting sessions. Combine that with the fact that he's by far the youngest player in this draft, not turning 19 for more than five months, and it's not unreasonable to think that he still has considerable room for improvement over the next few years, particularly if he can improve his shooting mechanics. In a perfect world, Kidd-Gilchrist would be drafted by a team that already has some talent in place, as he's probably not ready to carry a heavy scoring load early in his career. Regardless of where he ends up, though, it's difficult to see a team being disappointed in what he brings to the table, as he appears to be the type of player who will almost make the most of his potential, giving him very little downside. Clearly the most impressive prospect seen at this event, small forward Michael Gilchrist (#4 Scout, #3 Rivals, #3 ESPN) looked like the type of player who could step onto a college campus and contribute immediately, despite being only 17 year old. With a noticeably improved frame, possibly an added inch of height, and the same terrific competitiveness we've written about repeatedly over the past two years, Gilchrist made an unbelievable impact on the game he played and pretty much single-handedly took down a very good Bishop Gorman squad. Gilchrist's defense remains his defining trait, and looks to be approaching a level where he could get minutes against pretty much any type of opponent. The added strength he's put on has allowed him to play with even more aggressiveness, and when combined with his terrific wingspan and basketball IQ, makes him an absolute terror both on and off the ball. He starts playing defense as soon as the opposing squad inbounds the ball, getting up in his matchup's chest, attempting to deny him the entry pass, while also maintaining the presence of mind to be ready to help out his teammates if needed. He's phenomenal on the ball, active and intense, yet fundamentally sound, smothering with his length, and extremely physical. He's just as good off the ball, though, with his anticipation skills in the passing lanes, and ability to rotate as a help-side defender. Showing big, strong hands, and the willingness to make his presence felt on the glass, Gilchrist is an excellent rebounder who will go well out of his area for extra possessions. Constantly talking, directing, leading by example--whether on the court or standing up cheering from the benchGilchrist looks like exactly the type of player you'd want to have on your team. Offensively, Gilchrist was extremely aggressive, making a couple of shots both with his feet set and off the dribble from the perimeter, and doing a good job posting up his man. His advanced ball-handling skills remain improvable and his shooting mechanics are still not ideal, but his ability to bring the ball up the court, beat his man off the dribble and find the open man with pinpoint accuracy allows him to play multiple positions on the floor. He's always looking to set up his teammates, but has no problem asserting himself and taking a big shot himself if the situation calls for it. One of the most mature players we've ever seen at this level, Gilchrist is a player that NBA teams will likely fall in love with as soon as he lands in college. Physical attributes, defensive ability, scoring instincts, intangibleshe's a rare player who brings a complete package of skills to the table despite being only 17-years old. Whether he develops the offensive polish needed to emerge as a go-to option at the highest level remains to be seen, but no coach will ever complain about the effort he brings. Michael Kidd-Gilchrist came off the bench and didn't look to force his offensive opportunities except when called upon. Nonetheless, he played an important role on this USA basketball squad. Gilchrist did his best Scottie Pippen impression, defending the power forward position on one end and running the point on the other. He utilized his excellent size, length and athleticism to make his presence felt in Team USA's full-court press in particular and was a real sparkplug for his squad. He crashed the offensive glass, got in passing lanes, passed the ball unselfishly, and finished extremely well around the rim, firing up himself and his teammates, but always staying steady and under control. Gilchrist's offense is still a work in progress, particularly his outside shot, which can be very streaky, but you can't teach the basketball IQ and competitiveness he brings to the table. His intangibles are especially impressive when you consider the fact that he's just 16 years old. His instincts and commitment to defense are exceptionally rare traits for a player this young and give him a great platform to build upon as he continues to develop his offensive game. In the first few minutes of #1 ranked St. Patrick's game against #3 ranked Findlay, Michael Gilchrist re-aggravated a leg injury, as he started severely hobbling around the court. His coach pulled him out of the game immediately, but he demanded to be put back in within minutes. For the rest of the game, Gilchrist refused to leave the game, despite seemingly bruising another part of his lower body every time he attacked the basket. Still, he consistently ran the floor and fearlessly took the ball to the hole, dead set on doing everything he can to help his team win, playing 29 of 32 minutes. From a scouting standpoint, not much can be taken away from this game in terms of Gilchrist's skills or athletic ability, as he was clearly playing at nowhere near 100%. Before re-aggravating his injury, he made one nice baseline drive to the rim, and seemed to show good body control for most of the game, but he got by purely on heart and determination, scoring 19 points and pulling in 8 rebounds while getting to the free throw line 10 times. In terms of his shooting, Gilchrist has a noticeable hitch in his mechanics, which is very problematic when he's pulling up. His motion is consistent and accurate, though, as evidenced by his 9-for-10 shooting at the line. Honing his perimeter shooting ability will be the next step in Gilchrist's development, but he still has plenty of time to work on that. The biggest thing to take away from this performance is how rare of a competitor Gilchrist truly is, especially for a player of his caliber. The logical thing to do for the #1 ranked junior in the country to do in a fairly meaningless regular season high school game would be to not risk getting hurt any worse, but Gilchrist would have none of that. Instead, he fought extremely hard on both ends of the court, risking his body on every play. It would have been nice to see a lot more of Michael Gilchrist, considered by many to be arguably the best long-term prospect in high school basketball. Unfortunately we'll have to stick with an initial first impression after seeing some small glimpses. Thankfully for us, though, Gilchrist is only 15 years old, meaning we'll have plenty of opportunities to evaluate him down the road. Gilchrist passes the eye test on first glance, showing great size for the wing position at 6-6 to go along with an excellent frame and a reported 7-foot wingspan. He doesn't wow you with his athleticism initially (clearly he is still growing into his full athletic potential at this point), but seems to be a very smooth player overall and displays excellent body control, which helped him make a couple of very impressive plays, though. Gilchrist has an extremely versatile game for such a young player, as he can do a little bit of everything at this point. He appears to have some point forward skills, showing nice court vision and an excellent feel for the game. He can post up his man but also break down the defense off the dribble, being capable of making shots from the perimeter, despite sporting a slow, fairly ugly release on his jumper. His ball-handling skills are improvable as you might imagine considering the stage of development he's currently at. Defensively, Gilchrist is extremely active and competitive, which is not something you find in most young star players this age, and leaves a lot of room for optimism regarding his future development. He seems to have a great demeanor on the court, not being afraid to step up in important situations, but also not trying to impose himself excessively on the game. He seemed to take pride in crashing the offensive glass in the games we saw. Talent evaluators seem to unanimously agree that Gilchrist is an extremely special prospect with tremendous natural gifts. The challenge for him now will be to continue to play with the same type of fire that has allowed him to rise to the top of his high school class, and continue to work on his all-around game. That's not going to be easy considering how early the spotlight came for Gilchrist, as history hasn't always been all that kind to prospects who were discovered so early. We'll have to see how he continues to develop, and we're sure we'll be talking plenty more about him in the coming year.